Wow – some great deals on this magenta pump from Pour La Victoire, which I’ve long admired (and am actually surprised I haven’t posted before). I like the little ribbon detail on the vamp, the reasonable 2.5″ heel, and the high comfort ratings. I’m always a fan of a purple pump (great for navy, black, gray, and generally a flattering color to your legs if worn with a skirt), but there are also sales going on this exact shoe in red (at Endless for $85), and in gray and navy (at Zappos for $136-$156, limited sizes only). At Endless, it’s also available in black for just under full price – $185 rather than $195. The magenta (pictured) is $105 at Zappos, and $85 at Endless. Update: They’re also on sale at Amazon! The magenta and red are both $78, the black is $95, and the navy is $124. These shoes are also available at amazon.com starting at $78 with free super saver shipping! I have the magenta pair in 8.5 and they are fabulous! They are quite comfortable, fit true to size, and they look great. They might be too shiny for a more stuffy office but I work in state government so I can dress a little more casually. Maybe I should get another pair in another color??? Are they narrow? The endless reviews suggest they run on the narrow side. Does anyone have specific recommendations on good work appropriate dresses for pear shapes? I’m looking for links to specific dresses, if possible. I do pretty much all of my shopping online and have been discouraged by how many dresses I have had to return. My go to brand is Classiques at Nordstrom, but I’d love to hear recommendations on others. I’m usually a size 2 on top and a size 4 on the bottom. JCrew is a definite no for me – they seem cut for a much straighter figure. I’m the (exact!) same sizes. I’ve found that most sheath type dresses that I find at department stores fit on the bottom (or are a bit too straight up and down) and then are too big on top, where the zipper at the neck gapes weirdly. I’ve also had really good luck with the BCBG line of dresses that are a thicker jersey. They fall well, and I just pair the sleeveless ones with a fitted cardigan (they also do great double duty as a cocktail-ish dress for work events where you don’t want to wear business clothes but also don’t want to wear a sparkly cocktail dress.) Some of the BCBG patterns are a little loud, and some of the dresses are a little low cut (so I wear with a cami), but if your office is on the more business casual side, I think they’re a good option for pear shapes! I also suggest checking out BCBG dresses – they’ve been reliably well-fitting for my pear shaped self. A half-sleeve knee-length navy dress that somehow fits my top and bottom is the single most versatile piece I’ve ever owned – it’s perfectly appropriate for a conservative office (with a cami) and can be glammed up with cool shoes and jewelry for fun occasions. I’m typically a 6 on bottom and a 4 on top, and I’ve found Banana Republic to be more flattering for my shape than J.Crew. If you’re looking for something a bit more expensive than BR or Classiques, I’ve had good luck with Nanette Lepore, Elie Tahari and Max Mara. Thanks for the feedback. That DKNY dress is gorgeous, wish I could have purchased it when it was available. I have a similar one from Banana that I absolutely love. I will also check out BCBG. The few times I have tried on their dresses I find them too short for me (I like my dresses to be 39 or 40 inches, BCBG is often shorter than that). If others have recommendations to specific dresses, please advise. I also really like this Moschino dress; very comfortable and 40.5″ long. I’m a slightly bigger pear – 4 top, 8 bottom – and this new ann taylor dress looked great (she says modestly). plus sleeves! i also find calvin klein dresses to (generally) work well on me. a-line dresses are an obvious choice to cover up your peariness. i also look for the thickest possible fabric – wool rather than jersey – or the one with the least stretch, so you can’t tell that it’s squeezing over my hips. I agree about Calvin Klein. I’m a pear, and every Calvin Klein dress I’ve put on has fit me like it was made for me. It’s gotten to the point where I won’t even try one on unless I have the money to buy it because I know I’ll fall in love the instant I do. Me too. I’m 4/top, 6/8 bottom, and their dresses always fit perfectly. My favorite dress ever is Calvin Klein, a very professional navy sheath in a thick jersey knit. It has clean lines, but drapes amazingly, and came with a knit belt/metal buckle that makes my waist look amazing. I think it came from one of their outlet stores, actually, but I’ve been happy with everything I’ve ever purchased from them, across a broad variety of price points. My shape seems similar to yours with a long torso and I’ve had good luck with Antonio Melani at Dillard’s. I typically get a 2 if it’s a bias or flared cut and a 4 if it is a standard sheath dress. With Kay Unger it is about the same and I can do a 2 in Halogen. Gorgeous. I just purchased the Cole Haan Air Mid Talia in aubergine suede, and I’m struggling with styling a little. On the one hand, I know they go with a lot of neutrals, but I’m having difficulty in putting together the outfits. Do I need to wear purple or lavender elsewhere? Give me some tips from the Corporette goldmine! I have aubergine ballet flats (wearing them today, actually), and I almost never wear them when I’m wearing purple somewhere else in my outfit. It makes me feel too matchy. I wear them with all shades of gray, brown, and basically any jewel tone. I feel the same way. I wear my purple mary janes and my magenta/mauve suede pumps with almost any outfit and I usually am not wearing any purple/lavender/plum. If it makes you feel more comfortable, you can add a necklace in a similar but not the same color. A deep red could look nice. I also love teal or orange with purple. Deep green would look nice. Blue in a shade that goes with your coloring. With the navy, off white, cream, pretty much any pastel again, that match you. I treat aubergine as a neutral too and never wear mine with anything purple. I don’t think you need to wear purple or lavender everywhere. I’ve been lusting after those exact shoes (a bit out of my budget right now)–I want them to wear with grey pants, though I haven’t decide what top I would wear with it. They were on sale, which is the only reason I could swing it. Still kind of high, but worth it. They are super comfy and have made me feel happy every time I wear them. Love these shoes! I wear mine as a “neutral” with navy, gray, brown, or black clothes. I don’t typically wear purple shoes with purple clothing, but I do wear them with other colors if the colors will be “broken up” by a neutral (for example, royal blue or yellow top, charcoal trouser, purple pump). I’ll be wrestling with it, though! I don’t know if you want this kind of push, but in the last few years I’ve upgraded from the 50-70 dollar shoe range to the 150-200 shoe range (mainly cole haans, but a few others) and I think for the most part I can feel a real comfort benefit. But it still stresses me out to pay so much. I have also moved to higher cost, higher quality, higher comfort shoes. I watch for them on eBay, though, and wait for highly discounted prices. Unless you are really au courant and really need to buy this season’s shoes, waiting a few months usually turns up final closeouts on eBay. The trick is to know the name of the style and search for your size. Save the search and have eBay email you when a match is found. If you aren’t squicked out by used shoes, the best deals lie there. Otherwise, watch and wait for new ones. I have these in black and I LOVE them. They actually have padding right at the ball of the foot making them waaay more comfortable than any other pumps I’ve ever owned. The magenta is sold out in all three sites in my size… I should take it as a sign that I do not need the shoes, but maybe its a sign to go up 1/2 size? I had the same problem, and was about to take it as a sign as well…then found myself ordering 1/2 size up. Fingers crossed! Love love love love love these! I really need to start getting a paycheck soon. It’s summery in Texas. I need a source of ribbed cotton, spaghetti strap tanks w/the inner “shelf bra.” Mine are 10+ years old and now have shrunk. Yeah. Anyway, I had gotten mine at VS. I can’t/don’t shop there any longer. Does anyone have suggestions? They are my 9 months of the year go to under tshirts, polos, and just by themselves and shorts when kicking around the house. I have a bunch that I got a few years ago at Target that have held up well. They aren’t ribbed, but I buy mine at Old Navy. This is what I do as well. So few places seem to sell the inner shelf tanks, but I don’t need a bra and a tank covering my small 36Bs. I don’t know if I have ever seen ribbed shelf-bra tanks, but Costco usually sells 3-packs of non-ribbed cotton shelf-bra tanks (with the adjustable straps) for pretty cheap. I like the (non-ribbed) ones from Express. They come in a ton of colors and they’re long, but not bulky at all. And, I find the built-in bra is really supportive (and I have DDs). Wow! I LOVE these – what an awesome post. Unfortunately, they are out in my size at all three sites. Thanks anyhow! 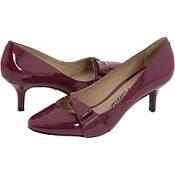 Please help Corperettes: I am searching for a pair of patent pumps in navy and wine, with a 2 to 2.5 inch. heel. I just want something plain, no open toe, no croc embossing, etc. Has anyone seen these??? The ones featured today come in navy. Okay this is trouble… I didn’t really care for these in navy but now I want the grey! Check out the Essex pump from Me Too. They are a little shorter, maybe 1.75 or 2″, and between $30-50. If you don’t like that style, I’ve seen other styles of theirs in navy, wine, and other patent colors. Threadjack.. I need help and was hoping someone out there would have some words of wisdom. I wanted to see if anyone has any advice for gaining more motivation to work. I really don’t know what to do. I used to be so diligent and had a great work ethic, especially in school, but also in prior jobs when I was younger. I’ve been out of school several years now and am supposed to be working hard on building my career, but I find that I just have no motivation. I find myself increasingly cutting corners and really not taking an interest in furthering my career or working towards any long-term goals, even though I know that I’m only hurting myself and my long-term prospects. I do still try to do decent work when I’m given projects, just not spectacular work, and I don’t really go out of my way to seek out more work when I’m slow. I thought maybe it was the job or career choice, but I’ve been wracking my brain for quite awhile now to think of what other job I’d like to have, and the answer is nothing — I just can’t summon up any interest in doing much of anything! What do you do if there is absolutely no career that you’re interested in doing? Is it normal to feel this at some point in life? I know that no one “wants” to work, and that it’s called work for a reason, but how does everyone else cope? It’s not so much that I “hate” my work or working in general, it’s just that I don’t care, even though I hate myself for feeling this way and being this sort of person, and know rationally that I’m just screwing myself over in the long run. Has anyone gone through periods like this themselves? Or has any suggestions for something that might help? Thanks so much in advance.. I feel the same way so I have no advice on how to snap out of it, but I’ll be interested in the responses! Not to sound alarmist, but is this trickling over in to other parts of your life? It sounds a little bit like depression. Just something to think about. This. That’s precisely how I felt when I was depressed. I would definitely seek counseling, it really can’t hurt. It does sound a bit alarmist to me. I’ve tried several careers and am always envious of people who really seem to find joy and excitement in their work. That never happens for me, but I am able to find things outside of work that I enjoy and look forward to on a regular basis. I think part of what contributes to depression is this idea that you’re supposed to find your dream job or a job that you can really experience with passion. I find that I am much more content when I just accept that it isn’t going to happen for me. There are plenty of people who live happy and fulfilling lives with work as something secondary. It is totally normal to work to live instead of living to work. I think many countries in Europe embrace this philosophy more than we do, and typically productivity tends to be higher there as well. I feel the same way! I haven’t even finished reading your post but I feel the same way! I’m going through a period like that myself. I used to look forward to going to work every morning, and now I feel like I want to quit and become a housewife – except that I am single! Yes, I have gone through periods of several months where I can barely do anything at work beyond the minimum required of me. If you generally like your area of work, it’s probably just that you’re in a rut. Can you seek out new assignments? I tend to get bored working on the same thing all the time, and if it goes on for too long it can lead to the general malaise you describe. I also find that I’m more likely to get in a rut if I’m working on one big project as opposed to a bunch of small ones – maybe a few small tasks to keep you busy all day would help? And I also agree with those who said you need something outside of work to keep you stimulated – try to exercise several times a week, and seek out an interesting, stimulating hobby. That should help too. I am totally there too! My billing is at an all-time low, and while there isn’t much work right now, there’s enough that I should be doing better. Yes! I have one in my office and I swear it helps my mood. Anon – I do not know you but from reading your post you sound depressed and that talking to a professional might help you sort through your feelings (e.g. is it really the job itself, your career choice, or maybe even something else less obvious to you or those of us reading your post). Some people are just complacent (hard for us “overachieving chicks” to reconcile with) so maybe you have achieved your goals and are happy to just stay where you are. I have days when I feel like you described – Im sure we all do – but if its an ongoing problem it may be something deeper. Good luck! Could you just be burned out? It sounds like you’ve been pushing yourself for a couple years. Have you thought about booking a short vacation? Even a few days at a tropical all-inclusive, with no email or blackberry access, can be quite restorative. Anon, I guess you can tell from all these responses that you are not alone. He said that he thought I would probably feel differently about my job if I was in love with someone. He went further to explain that, before he fell in love with his now-wife, his negative feelings about work impacted him so much more. He didn’t have something more important in his life than his work — it was really the only thing through which he established his identity, and it mattered too much. I’m now married, and loving my husband doesn’t make me love my job 24-7. But the fact is, being committed to someone else has helped me keep my job in perspective. At the end of the day, there is something more important to me, and that puts some spring in my step and helps me tackle the next day. Falling in love with someone, as hokey as that sounds, made a difference for me. That difference could also come from extracurricular activities that lead to meaningful friendships. That difference could perhaps come from one’s faith. The key (I think) is to lay down some roots somewhere other than the office. Ironically, it will probably make you more driven at work. KP, I think you are right on. I think my problem would be alleviated if I had a significant other. Growing up, I always had goals – get good grades, go to college, study abroad, take the LSAT, go to law school, get a job, etc. Now that I am an “adult” I have no more goals of that type. The future just looks like an endless stretch of one day after another going to the office and sitting at a desk for the next 29 years. Ugh. I still have goals in life, but they are now of the type that I have little control over so I hesitate to even call them goals. What I mean is that I would like to have a husband, or even just a boyfriend, and a child or two, but I cannot make that happen on my own the way I could all the other goals I have accomplished already. I agree with KP that life would be more meaningful and I would have more drive at work (even if I did not love my job) if I had a relationship. But unfortunately I cannot create one by myself and I seem no closer to finding it than I was last year, or the year before, or the year before. I have wonderful friends and my family nearby, and I live in the town I grew up in but those roots are still not enough to keep me going. I don’t think a relationship would solve all my problems but I do think it would help get me through. Yet it is the one thing I cannot make happen by myself. I say that’s right on. Growing up, we’re wired to achieve goals that come to fruition every semester, every four years, etc. We achieve the “job” goal and the question is: What next? I went through a period like this. It bothered me not to have drive, so I saw a therapist. I spent a few months talking things out and now take a little pill every day. If you aren’t disturbed by your lack of drive, I wouldn’t necessarily run this way, but it did really help me. was the therapist helpful, if so how? how long did this period last for you? did you end up staying your same job and everything, or did you have to make any adjustments with job or duties or career? I have felt like this since finishing college (going on 11 years now). I have little motivation to work and feel like I skate by on the bare minimum. Of course, I managed to go to a top 10 law school, get good grades and get 2 jobs after so my bare minimum must be on par with other peoples’ medium-high. I too have been to the p-doc and the therapist and now I take a couple of little pills every day. I feel happier but I still don’t have the drive I kind of wish I had. I do not mind being a lawyer; sometimes I enjoy it and sometimes I hate it. But like you there is no other dream career I wish I could have. An ex-boyfriend thought that was a particular character defect of mine. But yet I have never wanted to be a writer, yoga teacher, philanthropist, politician, extreme mountain biker, etc. I have the things I like to do in my spare time but no one true passion. I just feel I do not have the energy to put in more than 4-6 hours of work per day. Maybe someday I will find that thing but for now I am just trying to do the best I can. wow, you sound just like me. especially the part about not having the energy to work more than 4-6 hours a day. Threadjack. Regular commenter, different moniker. So about a week ago, I had my ‘meeting’ re performance/compensation (midlaw; partner; not sure why it’s done like this, but we get our ‘bonus’ for previous year two months into this year, so we are talking 2010 financial performance). Anyhow, last year was super turbulent, but firm did well (a few points over budget on revenue; costs at or under) and I did VERY well – like about $250-$300k profit, after subtracting overhead, base salary, etc). So I was expecting (realistically – my firm is not known for generosity to the minders/grinders like me, and other arbitrary factors are not in my favor, although quality is not an issue – solid there) a mid five figure bonus (base stays same), and I was optimistically thinking high five figures would be niiiice and, well, fair. I got low five figures – very disappointed and I told the reviewers I thought it was pretty cheap (not in those words). I know that other similarly situated people received more than I, and several who produced less got about the same as I did. It’s not the end of the world, I’m reasonably happy, devil that you know and all that. I’ve never ‘pushed back’ on comp before and I am having a terrible time trying not to feel like I alienated myself altogether – like I whined unduly or something, and now I am perceived as ‘less than’ a team player, entitled, bad attitude, what have you…. Any pearls of wisdom/commiz/encouragement? TIA. I have been in your situation before. I went to my direct supervisor and explained, very rationally, why I thought the situation was unfair and what exactly I had done that made me believe that I deserved more money (i.e. emphasizing that I had brought value to the firm and deserved to be compensated for it). He went to the managing partner and then sent me to talk to the managing partner myself. Three days later I got a raise (we don’t have lockstep compensation). Obviously, whether or not this is possible depends on the firm and compensationg structure. But in general, I think it’s fine to push back, politely. Make sure your argument is rational and less about you and more about what value you bring to the firm. Another thing to consider personally – I wouldn’t bring this up with your supervisor – is why you were treated differently than others. Do your colleagues not see you as a hard worker? Do they not realize that you’re responsible for bringing in money? Or are they an old boys club and they’re giving you short shrift because you’re not one of the favorites? Etc. I’ve also pushed back (in a reasonable manner) and received what I wanted, but I was going for a promotion. I simply said “I put in my goals for last year’s evaluation and at the mid-year evaluation that I expected a promotion and I’m surprised I did not get one. May I see the requirements for the promotion?” and my manager and I left it with that. I followed up with an email to that effect along with what I thought the requirements were for the promotion (and in fact was able to cite examples of tasks I completed that satisfied every requirement for the level above me, the level above that and some requirements for the level above the level above the level, lol.) Two or three weeks later I got the promotion and a raise even though that company claimed they never gave both at the same time. Be impersonal, reasonable and calm and you should see good results. Sadly, they don’t come in my size, 5.5. Is it just me or is it harder to find 5 and 5.5 size shoes than a few years ago? I never remembered having this problem, but now do all the time. I don’t have small feet but my 26″ waist/36″ hips are having a hell of a time finding ANY pants to fit. Can’t find any that are gaping huge (grand canyon huge) at the waistline. This used to never be a problem; I could grab a size 4 in pretty much any line and be good to go. I have almost exactly the same measurements as you do. Try Classiques Entier pants from Nordstrom. Full price they are about $200, but you can get them on sale for as low as $80. They’re fantastic on a more curvy shape. I also really like a pair of wide leg trousers from Halogen (also at Nordstrom, it’s a cheaper line as well). Ann Taylor now has three different cuts of pants, and the “curvy” cut fit my little waist/bigger hips combo without gaping. They were higher cut, which helped. My tailor also fixes the pants gape pretty quickly and cheaply – do you have a good tailor? They might be able to help you. I am also wide-of-hip and slender-of-waist. I found some pants at Dillards in their “Investments” line that fit me perfectly. I think it might be their house brand? I normally don’t go for shiny shoes but I really like this. They aren’t street walker looking at all, nor are they matronly or frumpy. Like the suggestions on what to pair them with too. Amazing. Just ordered in red on amazon for $78!!! I have amazon prime, so will get them tomorrow. Great deal, I can’t wait. Thank you for posting these! I had actually bought them in grey from Zappos, but I really wanted the navy (which they didn’t have in my size). Now the grey ones are going back to Zappos … and the navy ones are on their way to me via Amazon. Happy Friday, indeed! I got these on Amazon – ordered them yesterday afternoon, they were at my house when I got home today around 8pm. Amazing. They’re more of a dark raspberry than either a magenta or a purple. Someone asked if they’re narrow – I definitely don’t have narrow feet, and they seem comfortable (just walking around my apartment so far). I generally don’t do well in stilettos but they seem relatively stable. I actually need new black pumps – more than bright-colored ones! – but am trying to remind myself that I also don’t need 2 pairs of the same shoe.